A poll conducted by Moen reveals that 20 percent of men say that sharing a bathroom with someone who leaves toiletries, makeup and other items out on the bathroom vanity is among their biggest pet peeves. While women are not the only ones guilty of adding clutter to the bathroom, there are ways members of both sexes can create a more harmonious master bathroom. "Careful design, dedicated space for each individual and a willingness to compromise can make even the smallest room feel more spacious," said Moen's Tim Bitterman. A bathroom vanity with ample storage can help to keep clutter to a minimum. Extra shelves and cabinets can also provide a home for all of the everyday items individuals use in the bathroom. 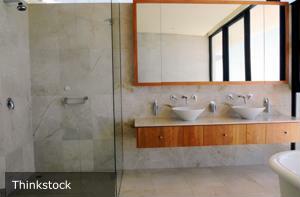 Couples who have enough space often choose to install a dual vanity so each person has their own sink and storage space. While a lack of space may make installing a vanity with two sinks impossible, some choose to add two pedestal sinks side-by-side instead. A bathroom faucet with a high arch can also help to make using one sink easier for couples sharing a bathroom. Other popular design ideas for master bathrooms include installing two robe hooks for clothing and double a towel bar for towels.